There are 15 different actions you can use. Hide the line, Highlight and Rewrite cannot be used for aliases and keybinds, however. This is the most basic and commonly used action. The trigger will automatically send text back to the game. In this example, the action will send attack rat when called. The action will just display a notice using whatever colors you choose. Typically players use these to get something to pop out at them so they know it has happened, but they may not want to automatically respond. In the example below, the game will display a bright red HIT HIM AGAIN when called. The action is used to display a desktop notification when a trigger has fired. In the example below, we have created a trigger that will display a desktop notification when someone has entered the room with you. Here is an example of the notification that will appear. This action will allow you to play a sound when an event is triggered. In the example below, an alarm will sound whenever another player enters the room. The wait action is usually used in conjunction with other actions. In the example below, we wait 3 seconds and then attack the rat. This action is essentially a temporary trigger. It allows you to specify a line or pattern to wait for. Once encountered, the script will continue executing normally. If not encountered within the specified timeout, the script is aborted. In the example below we have created a simple trigger that will fire when the client receives the text 'You have regained your mental equilibrium.'. The first action will then cause the trigger to wait 10 seconds, looking to receive the text from the game, 'You have recovered balance.'. If the trigger receives that text within 10 seconds, it will send the next action, which is set to send the command 'kick rabbit'. You can also opt to just hide any line that matches your trigger. Sometimes this is good for text that you see over and over again and are tired of reading. This is also referred to as a gag or gagging. This will highlight the text you have matched. There are more options here to highlight the text around the trigger as well. A rewrite will change the trigger text into whatever your would like. Players will typically use this to shorten long messages in combat. In the case below we are rewriting the text in the trigger to display a bright yellow, Balance back. Linkify is similar to rewrite, and will change the trigger text into whatever your would like it to say. In addition it will make the text a clickable link, which can do whatever the user wants. In the case below we are rewriting the text in the trigger to display the text 'Need to wake up!' and making it a link that will issue the command to 'wake'. The modify variable action is used to modify a certain variable. You can set it to a value, increase or decrease its value, assign the value of another variable to it, or modify it by the value of another variable. You can also assign the matched text or a captured part of it. It is a fairly flexible action. 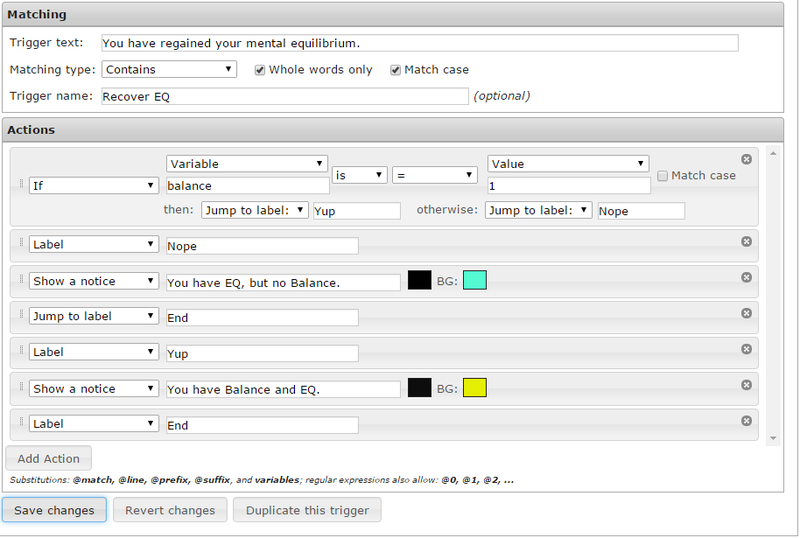 In the example below we have created a trigger that will set the @EQ variable to a value of 1 when your character has regained mental equilibrium. In the example we also display the value of the @EQ variable so that we can make sure it is correctly set. This is probably very redundant, but is a simple example. This is one of the more powerful actions for reflexes. It will allow your reflexes to execute actions based on if certain conditions are true or not. For example, you can compare two variables, or a variable and a fixed value. You can also compare against the matched text or a captured part of it. When the check succeeds or fails, you can choose whether the reflex should continue running normally, stop, or continue running from a Label action. The example below is very simple. When a character recovers equilibrium it will check to see if the balance variable has been set to 1. The balance variable has been set to 1 or 0 from another reflex. If the balance variable is 1, it will jump to the 'Yup' label and then show a notice that the character has both Balance and EQ. If the balance variable is 0, it will jump to the 'Nope' label and show a notice that the character does not have Balance. It will then jump to the 'End' label. If it did not just to the 'End' label it would also do the Yup label action and the 'You have Balance and EQ.' notice. This action allows you to repeat a block of actions multiple times. All actions up to a label that you specify will be repeated. This action does nothing at all. It is used together with the If, Repeat, and Jump to Label actions to do conditional execution and looping. This action causes a jump to the label of your choice. It is best used inside an If or Repeat block, so you don't create an endless loop (the client does offer protection against these). The example below is absurd, but shows exactly how it functions. In this case the first action jumps right to the third action. Missing the second action completely. This simple action disables the current reflex. This is useful when creating reflexes that should only work once. This action disables a reflex of your choice. The reflex must have a name. It can also disable entire groups of reflexes. In the example below we are disabling a group that contains all of our bashing reflexes. This action enables a reflex of your choice. The reflex must have a name. It can also enable entire groups of reflexes. In the example below we are enabling a group that contains all of our bashing reflexes. This action will stop all actions after this point. Useful for testing and for use in IF actions. Reset to default - Set a button back to the default. This page was last modified on 18 March 2018, at 17:14. This page has been accessed 74,733 times.